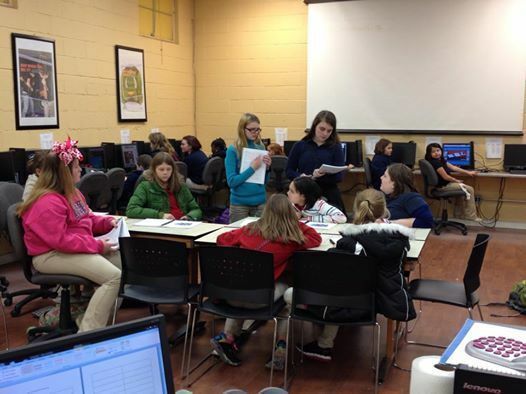 2015 No Limits Girls Aviation Program - Aviation Adventures, Inc.
Semmes, AL - Friday - January 9, 2015: We have been waiting for this now for nearly 4 years. Our vision is taking shape and the girls are coming full circle. 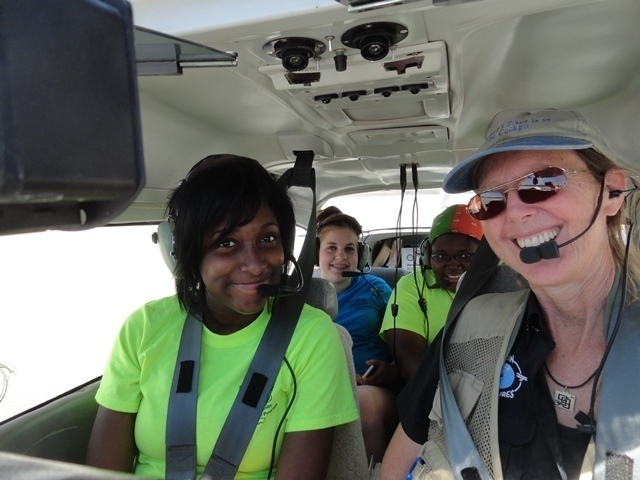 Thirteen of the original students from the 2011 "No Limits Girls Aviation Program" will be leading the pack. 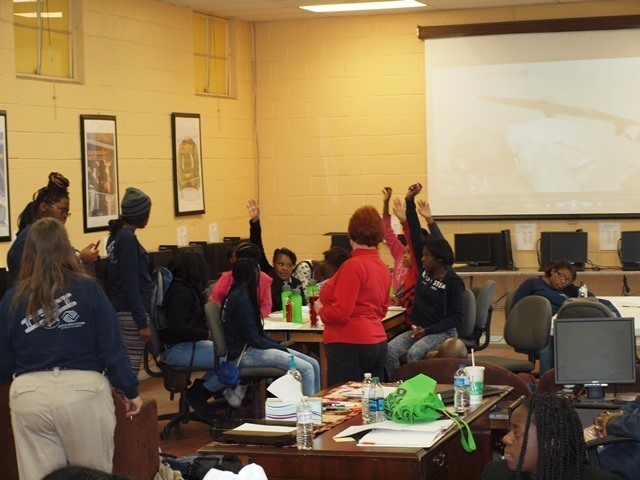 Yes, the students are now the teachers as we embark on the 2015 No Limits Program. ... and I got to witness the phenomenon first hand. Friday was my day to help stuff goodie bags for the girls and help set up Semmes Boys & Girls Club for the introductory meeting. Tomorrow we will watch Breaking Through the Clouds, make paper airplanes, learn a little race geography and learn the phonetic alphabet. The girls will be in competition to win ticket to exchange for prizes at the end of the day - and such cool prizes we have for them! (but I digress)... While on my stuffing mission, I see Ivy standing around group of girls talking about the aviation vocabulary: "leading edge, chord line, angle of attack". They are working on a lesson from the Adventure Guide. She calls me to give a demonstration and add some information about wings and lift. We used the students to make a wing then run from the leading edge to the training edge at different speeds to show how air moves faster over the top of the wing to meet the air as it passes the trailing edge. It was not long before I was hearing the phonetic alphabet. Jennifer would start spelling and the girls had to write down the word: ROMEO-OSCAR-DELTA-ECHO-NOVEMBER-TANGO. I just smiled and finished stuffing along with my other assigned preparatory duties. Tomorrow will be a blast. Coast Chapter 99s, Carol Voss and Kimberly Winner. Each of us spoke about our aviation careers and what we loved about aviation. The documentary Breaking Through the Clouds was shown. The girls listened intently because there were questions about the film in the Adventures Guides. All correct answers earned them a ticket to be redeemed for prizes after the days events. 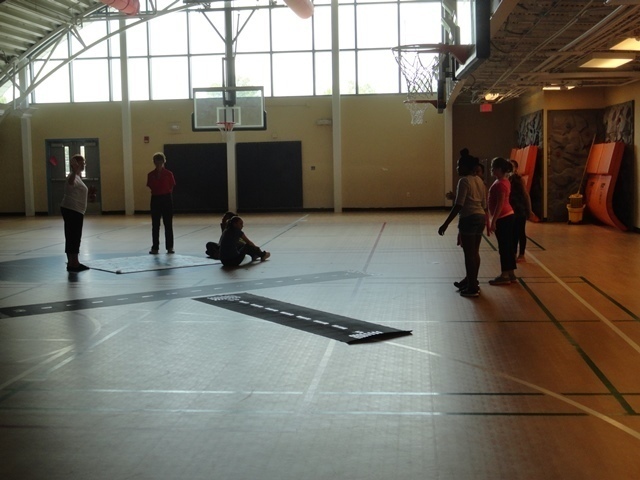 Our first break found us running relay races in the gym naming airplane parts followed by a paper airplane contest. The club from Optimists, dubbed "Optimist Airlines" ad the winner of the airplane contest had their pilot heave a paper airplane all the way across the gym to hit the wall. 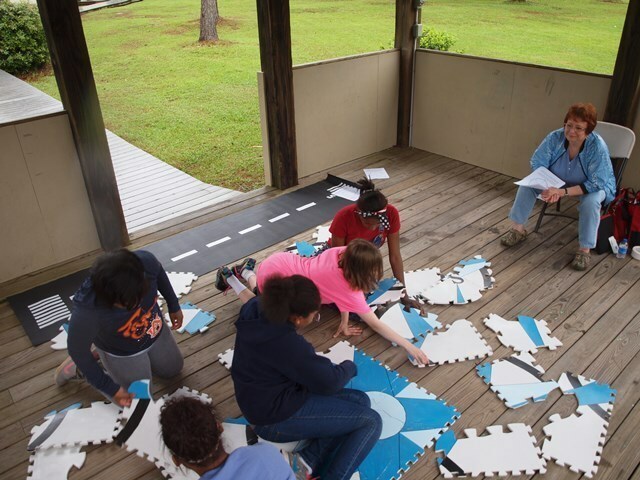 Our next break was an exercise called charting the course where the students had to identify the states on the map where both the 1929 race and the 2015 race stops. This is a challenge for most of these girls but it gives us a starting point so we can all see where they came from and where they will end up at the end of the program. We finished with more movie questions and the girls spelling out their names in the phonetic alphabet before the dashed off to redeem their tickets for prizes. Jeppesen dry erase board so they could take notes to earn Bonus Bucks for prizes. 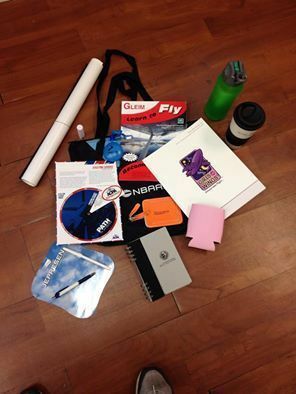 A special thanks goes out to Inger Anderson, Boys & GIrls Club of South AL, Jeppesen, Girls With Wings, AOPA, NBAA and Gleim for your generous swag donations and to 99s Carol Voss, Ellen Herr, Mary Wunder, Pamela Flesher and Sharon Skrabacz for your time in volunteering with the "No Limits Girls Aviation Program". Mary Wunder, Capt Judy Rice and Deb Henneberry along with Terry. Introductions were made and the girls were told to select an individual to chat but to move about the room to make sure they had time to talk to all. Almost immediately, Deb Henneberry - Flight Instructor and recruiter for Vaughan College in New York - was mobbed with girls wanting information on flight schools, admissions and financial aide. The #2 "flockee" was Capt Judy Rice. The girls wanted to know all about her around-the-world flight and how she has financed her flight training over the years. The evening ended with all having a nice BBQ dinner talking airplanes and hangar flying. 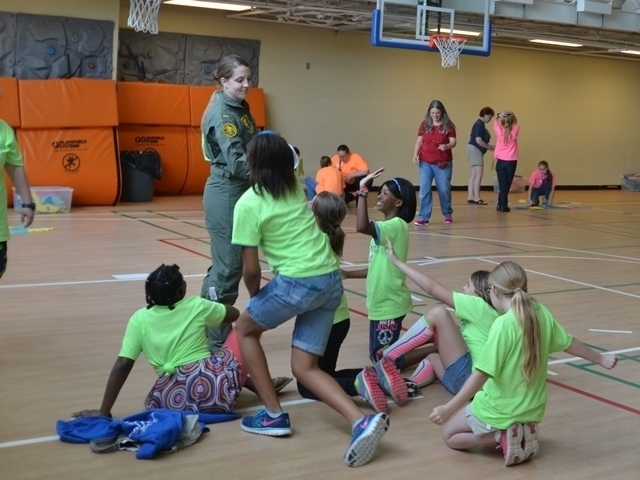 What an incredible day Saturday: over 20 female aviation professionals from a myriad aviation professions converged in Mobile for the 2015 "No Limits" Career Day. We were honored that WASP, Bee Haydu was able to join us and give the girls an interesting and informative talk about life as a WASP back in WWII and how she continued her flying career post-service. Bee made quite an impression on the young ladies and was mobbed for "selfies" afterward! Signature FBO told us all about the function of an FBO and jobs available there. Finally, at Continental Motors Manufacturing Plant, the girls had 7 aircraft engines and a variety of parts to look at touch and learn how they function. There was a flight surgeon, flight simulator, A & P/IA mechanics and an NTSB investigator. 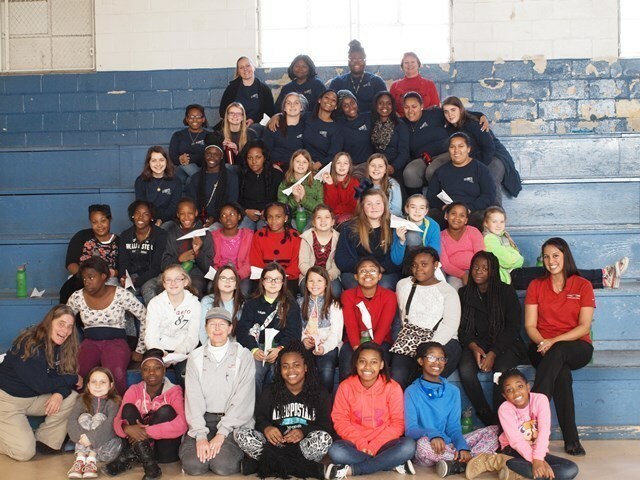 Approximately 85 girls came for the program from Boys & Girls Club of So AL, Boys & Girls Club of the Emerald Coast and BC Rains Aviation High School. 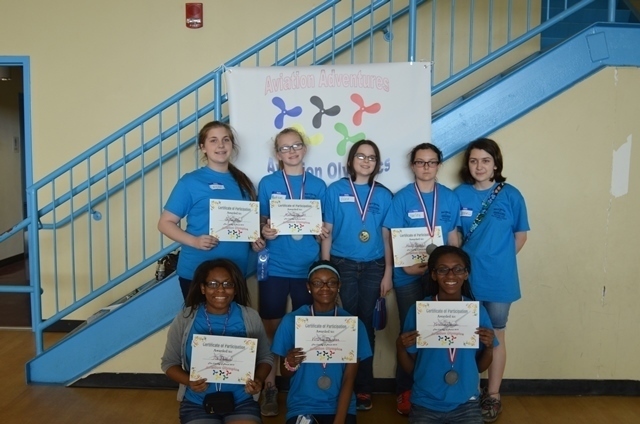 March 21, 2015 - Aviation Olympics: Such an awesome day for the girls. 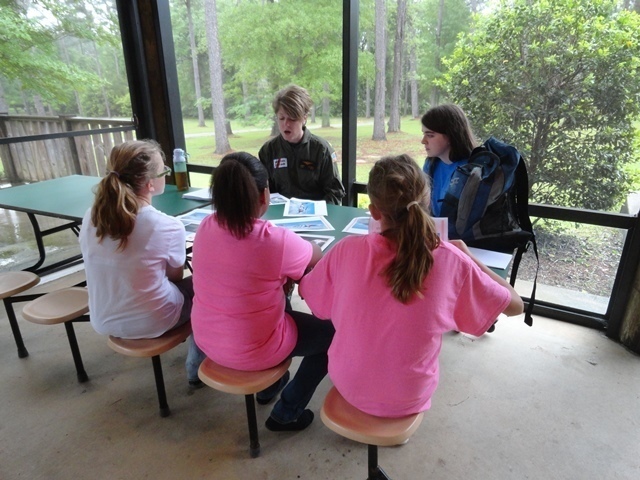 The BGC South AL girls got to Fort Walton Beach Friday evening for an overnight at the club. The were giddy with excitement when they got there and were hours calming down. I was wondering how they would be awake enough to compete in the morning. 0800 ready for briefings and set up. We had giant US maps to have ready, posters, papers rooms full of events to set up. With everything completed in record time, the girls began to filter in for the events. 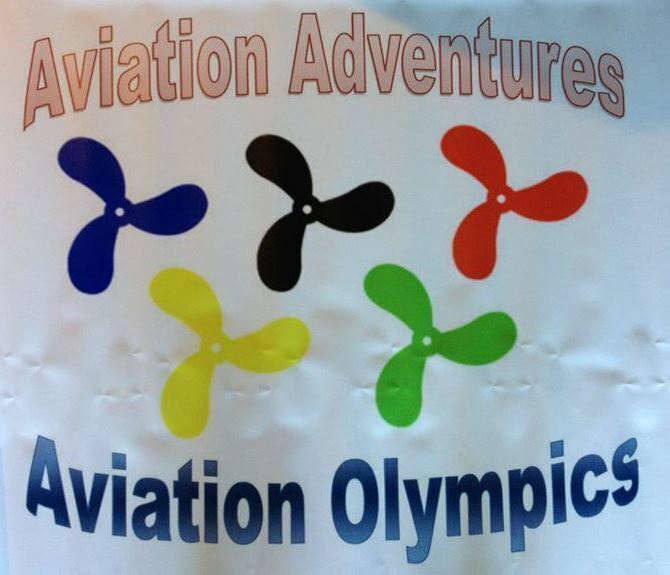 Each of the 6 teams sported their own vibrant colored T-shirt with the BGC/Aviation Olympics logo that was specially designed for the event. We lined up everyone and started with the first event - US Map Assembly. 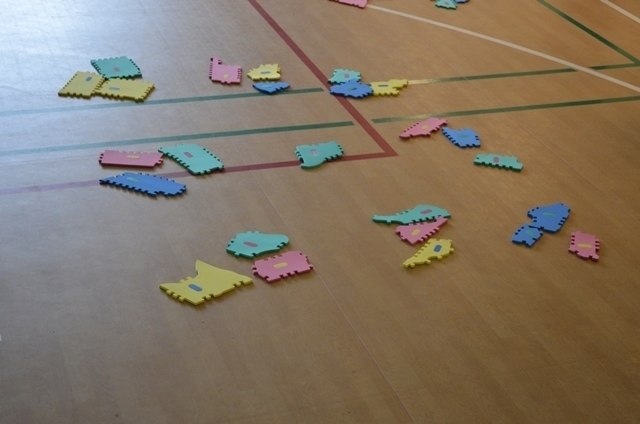 The girls were cheering each other on as the took turns selecting puzzle pieces and started assembling the map. Nerves were apparently running high as some of the girls ran to the map only to draw a blank. We released the whole team to complete the map assembly and saw nothing but hands and puzzle pieces flying. In no time, the first map was complete; the rest fell into order shortly. 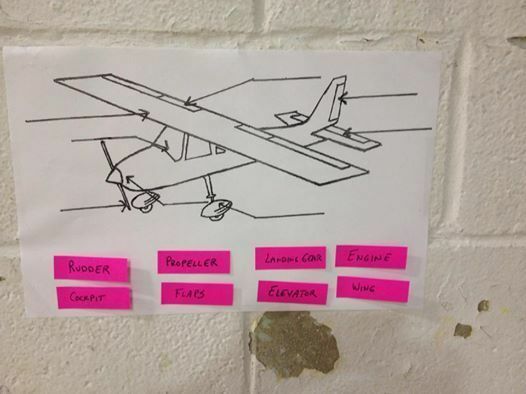 Event ribbons were awarded and we were on to the next relay: Name the Airplane Parts. This was a larger version of a former activity and the girls know exactly what to do. It was a real race to the finish as the teams all finished quite close together. It was really a matter of which team ran faster. 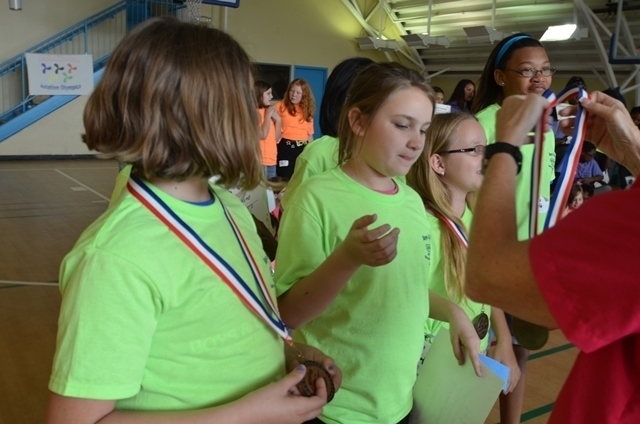 The events continued on with both individual and team events. 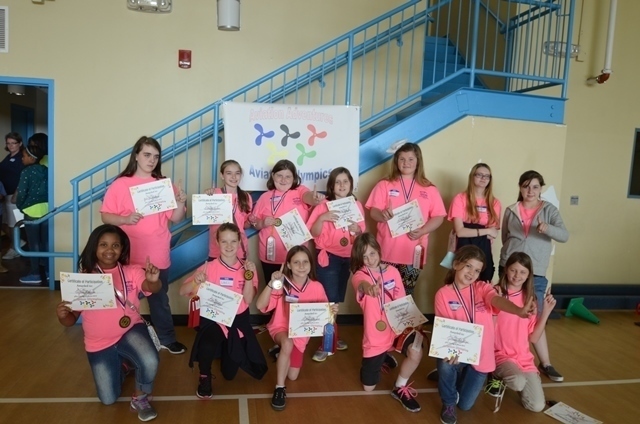 The individual events say 12 girls per event head scratching and teeth gnashing as they worked their way through puzzles and aviation mind benders. Individual event ribbons were awarded. was called. 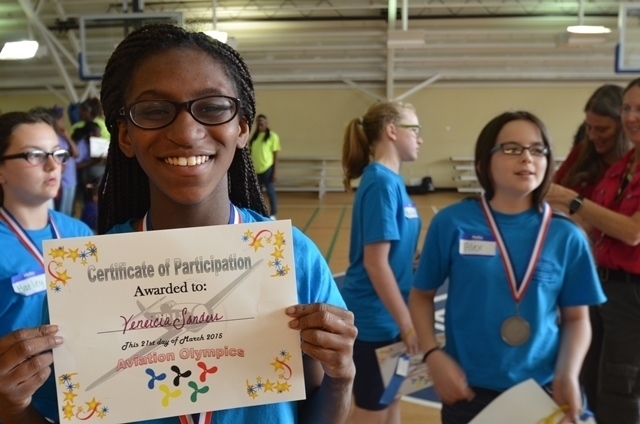 While the judges tallied al of the scores, the girls each were awarded Certificates of Participation. This was a big deal to them. They were competing against strange kids; they had to quash those inner little voices of fear and speak up, speak out and shine like the stars they are. They were all amazing and each girl walked away with a renewed sense of pride, a nice certificate and several event ribbons. Blue Team from BGC So AL, Soy Callahan. 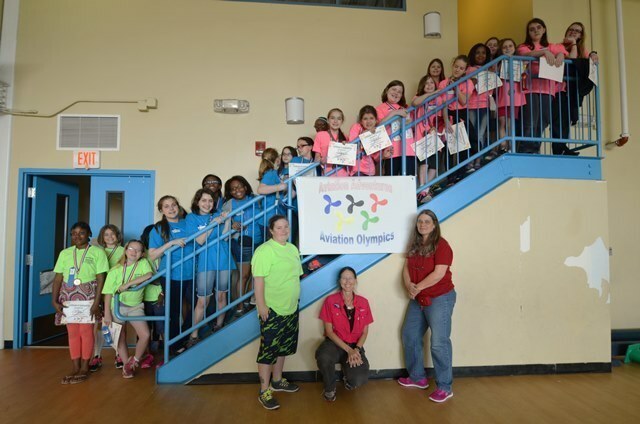 The gold medal winners were the Hot Pink Team from BGC South AL, Semmes Club. 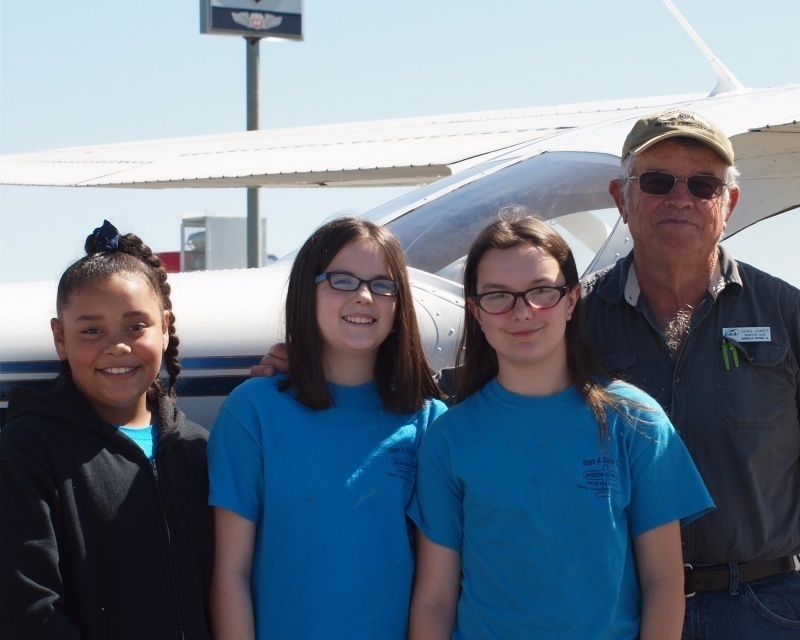 April 11, 2015 - Fort Walton Beach Aviation Extravaganza: With weather threatening to put our aviation extravaganza plans in "Plan B"
mode, we gathered our volunteers and our wits and set out to Fort Walton Beach for the day with the local girls. We were fortunate that the weather held out and the day was awesome albeit overcast. that they had completed to date. 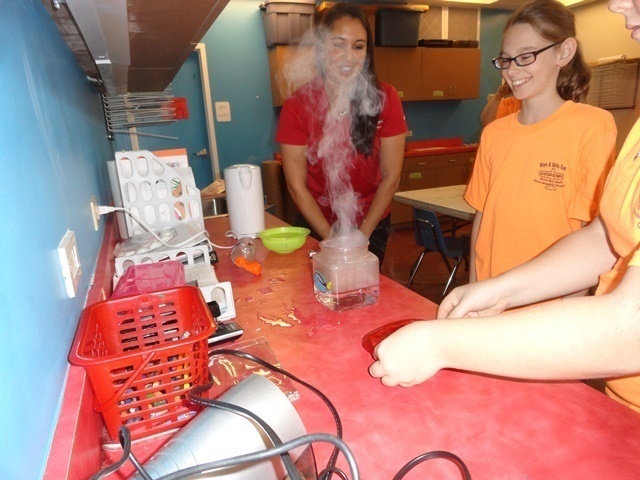 making a cloud in a bottle and the other to demonstrate the effect of temperature on air molecules. The girls were amazed to watch a bottle blow up a balloon when it was placed in hot water! compass rose puzzle for their direction indicator. The girls "flew" into the BGC Airport and had to follow the instructions of ATC, "landing" on the assigned runway. But the highlight of the show was the Eglin Aero Modellers RC Club with their simulator and flying the RC planes. 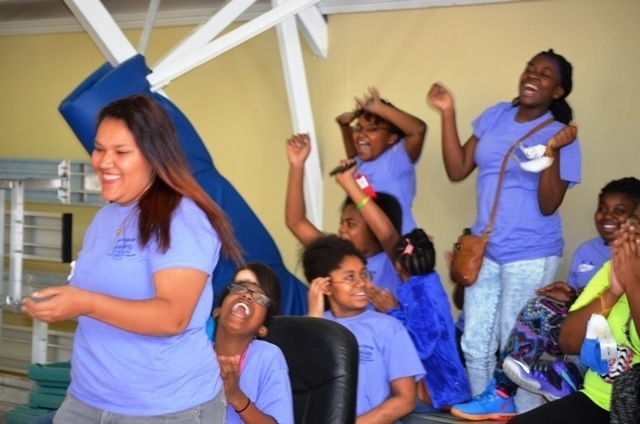 All of the girls had the opportunity to practice with the simulator then go outside and for real fly the RC planes. Some were real naturals! 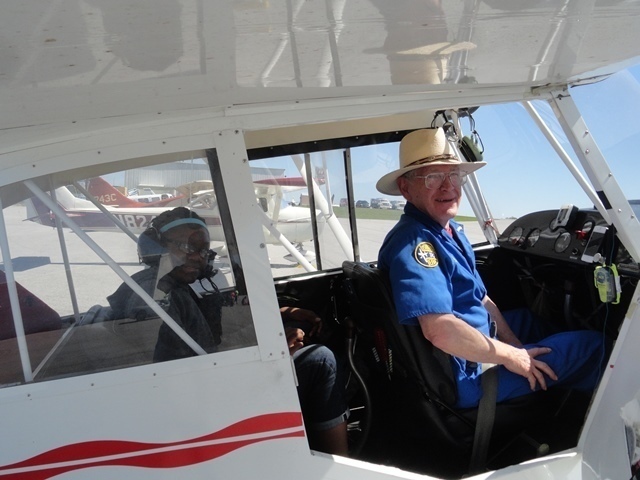 It was an outstanding event and the Club will be following up with the Eglin Aero Club, already having scheduled several summer dates to go to the Eglin Field to fly the planes and become more proficient in their skills. week with a few new twists. 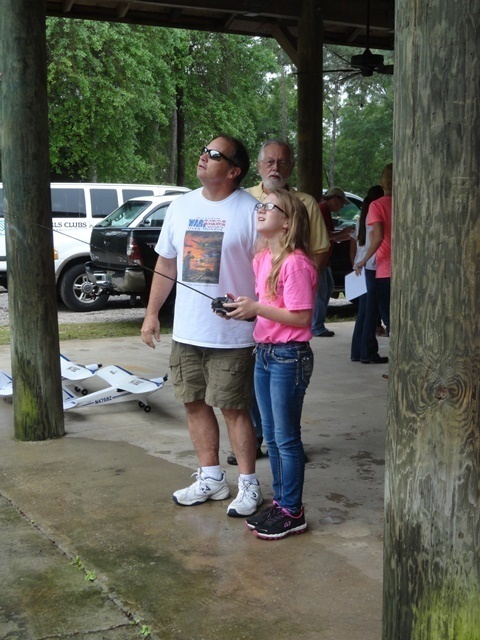 The Azalea City Aero Model RC Club was on hand to steal the show with their RC demonstrations, quad-copters to fly, RC aircraft to fly and cool gadgets for the girls to test out. One of the quad-copters had a forward facing camera and was linked to a set of "Star Trek-looking" set of goggles that allowed the wearer to see as if they were flying in the quad-copter. airworthy status soon. The quad-copters were a better fit for the confined space of the camp. Although it is a 150 acre facility, the abundance of trees makes it a not so ideal spot to fly RC planes. 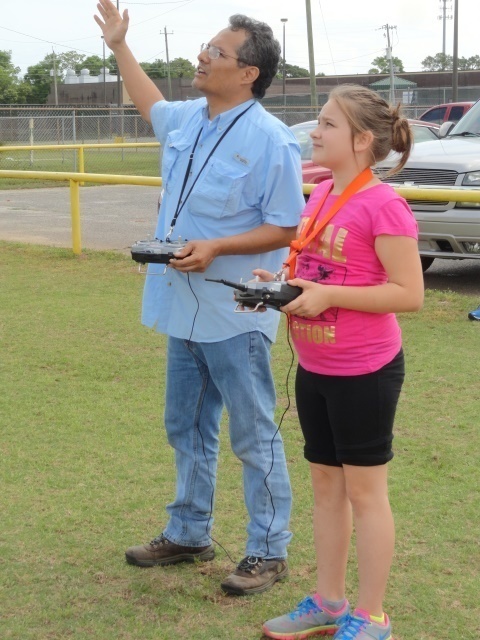 But the Azalea City guys did an awesome job and they girls learned a bunch about RC planes, aerodynamics and IMC! clouds.... Amy from the Coast Guard occupied the other half of the weather chat with information on severe weather and is impact on aviation. 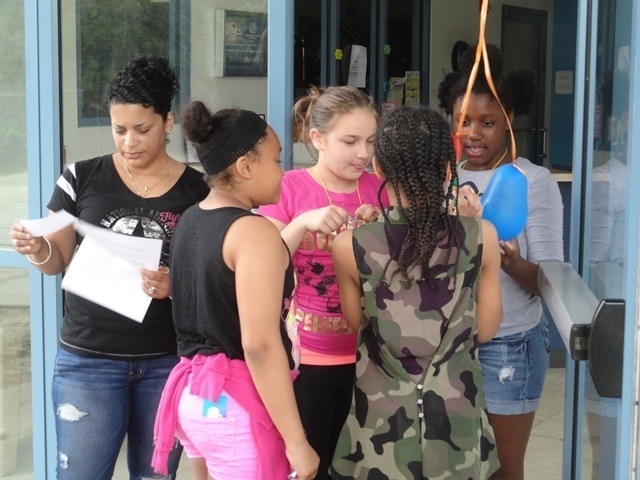 She presented the girls with a graphic handout and answered questions about weather and aviation. finish their job. It was good to see that they had so much fun that they wanted to finish. 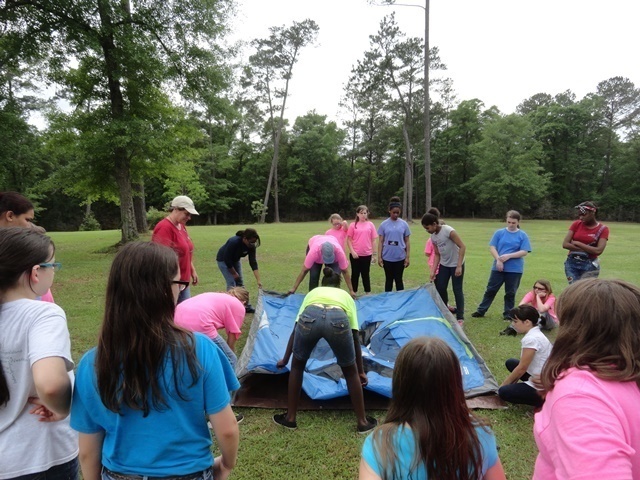 After the program ended, this group stayed for an overnight campout so the girls learned how to pitch a tent and how to make s'mores. 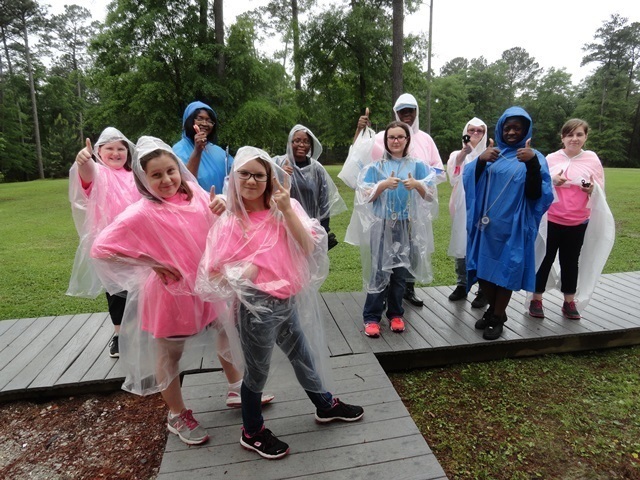 W cancelled the survival demonstration as the rains returned and we felt that the girls were getting sufficient survival training just dealing with tents and rain! What a great day and a great adventure for these girls. We hope it is a day they will never forget. best for flying lots of kids. But the 172, the Champ and "Wild Mama" (the 182RG) stayed strong all day and got the job done!!! The girls were a mix of excitement and trepidation. With such a large group we divided them in half and gave them the general "here is a small airplane" briefing while the other half completed the registration an weight process. The girls were interested in touring this 1946 Champ that was used for the demonstration (although not for the flying). Simultaneously were the helicopter demonstration and movement of static displays for the other event at the Fairhope Airport: the ribbon cutting for the new aviation school next to the airport. It was a busy day, indeed! Terry started out with her first group in the 182 following the Champ, the 172 and the other planes as we had briefed. We took off on runway 1 and headed north to the interstate highway, west to Mobile Bay, then south along the shoreline and back to the airport flight pattern. It was a thrilling flight for the girls. Vern took the second flight in the 182 but was called away to work on the mechanic for the other planes so Terry continued with Shad in the 172 and the Champ flying hard. The last groups that flew with Terry came with a "pilot-in-training". Three of the girls who sat up front and "rode shot-gun" got the change of a lifetime to fly the plane! All of the girls were awesome pilots! 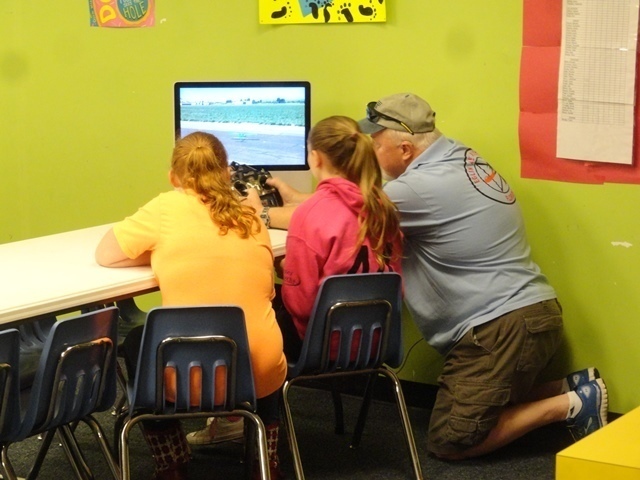 Over the next month, the girls will be assigned to Air Race Classic Racer teams to complete the program and participate in "Adopt-a-Racer". The race teams - 27 out of the 53 teams registered plus 2 AWAM mechanics will ask and answer a variety of questions about flying, racing, working and life in general. one of their heroes, Bee Haydu. This was also the first year that the girls got to witness a take off. They came to the start the day before and met with their pilots from the Adopt-a-Racer Program over a pizza buffet lunch. Then, they were up at the early hour of 8:00 am to watch all of the racers take of on the first leg of the race. Thursday, listening to the DJ, meeting and greeting the pilots and enjoying the other special activities at the airport. Guard. Both are promised exciting lives and exciting careers. We are proud to have had a little hand in helping to build the confidence ad leadership abilities of these fine young ladies and we wish them well in their careers.